Download "The Role of the Oncology Team and Services"
1 The Role of the Oncology Team and Services Advanced Practice Group The Advanced Practice Group consists of nurse clinicians, clinical nurse specialists, nurse practitioners and nursing program coordinators. They are an important part of the treatment team. These nurses have extra training and/or experience in Pediatric Hematology and/or Oncology. 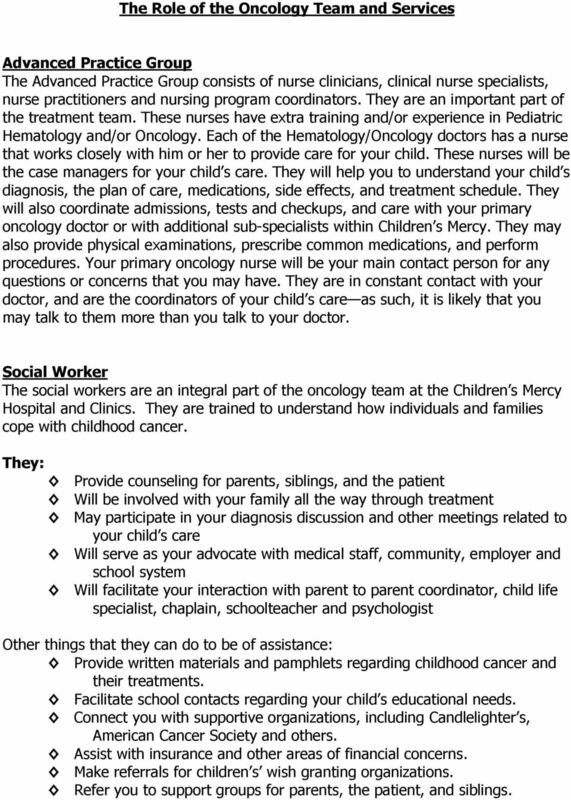 Each of the Hematology/Oncology doctors has a nurse that works closely with him or her to provide care for your child. These nurses will be the case managers for your child s care. They will help you to understand your child s diagnosis, the plan of care, medications, side effects, and treatment schedule. They will also coordinate admissions, tests and checkups, and care with your primary oncology doctor or with additional sub-specialists within Children s Mercy. They may also provide physical examinations, prescribe common medications, and perform procedures. Your primary oncology nurse will be your main contact person for any questions or concerns that you may have. They are in constant contact with your doctor, and are the coordinators of your child s care as such, it is likely that you may talk to them more than you talk to your doctor. Social Worker The social workers are an integral part of the oncology team at the Children s Mercy Hospital and Clinics. They are trained to understand how individuals and families cope with childhood cancer. They: Provide counseling for parents, siblings, and the patient Will be involved with your family all the way through treatment May participate in your diagnosis discussion and other meetings related to your child s care Will serve as your advocate with medical staff, community, employer and school system Will facilitate your interaction with parent to parent coordinator, child life specialist, chaplain, schoolteacher and psychologist Other things that they can do to be of assistance: Provide written materials and pamphlets regarding childhood cancer and their treatments. Facilitate school contacts regarding your child s educational needs. Connect you with supportive organizations, including Candlelighter s, American Cancer Society and others. Assist with insurance and other areas of financial concerns. Make referrals for children s wish granting organizations. Refer you to support groups for parents, the patient, and siblings. 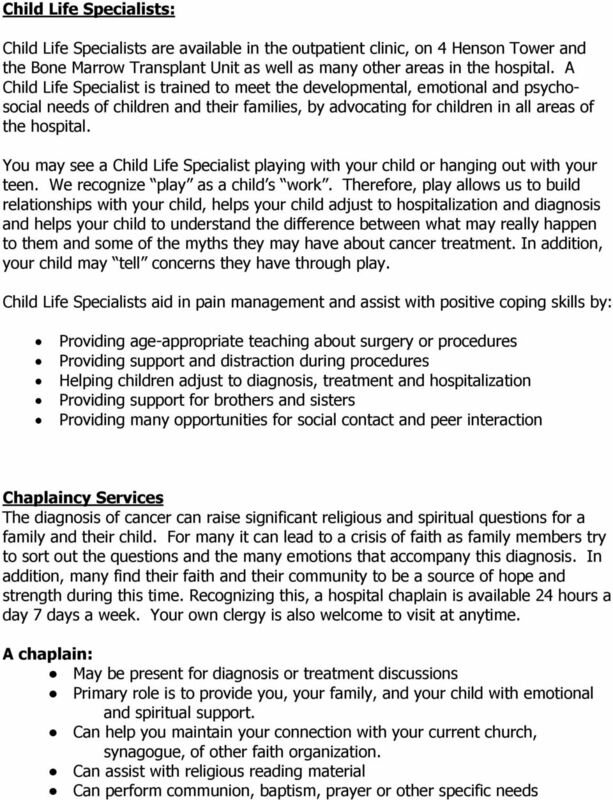 2 Discharge Planner: Taking care of your child s healthcare needs at home may seem like an overwhelming task. There may be times that a home health company will need to provide medications or supplies during certain times in your child s treatment. There is a discharge-planning nurse on 4 Henson to help coordinate your child s care after discharge from the hospital. 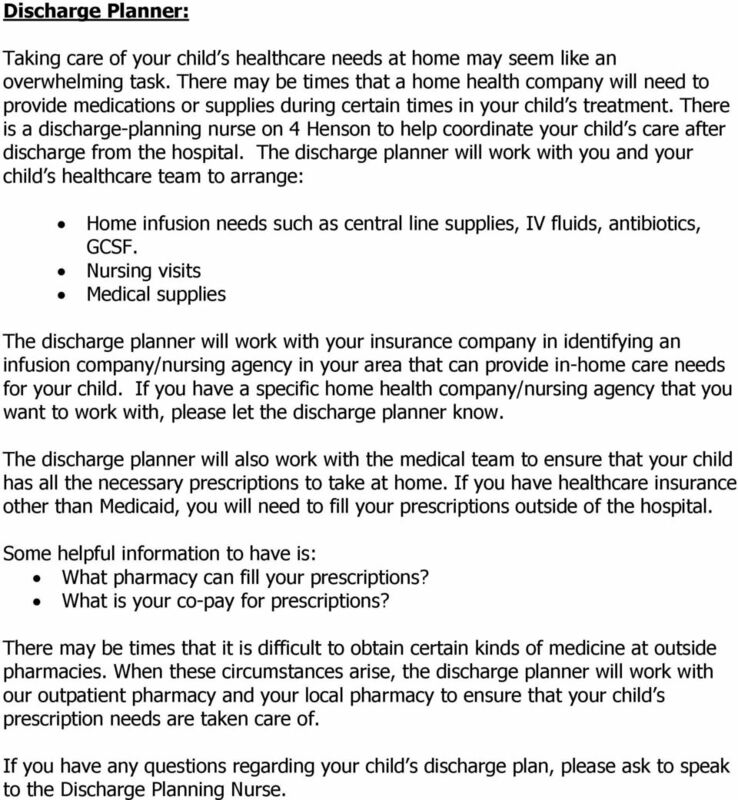 The discharge planner will work with you and your child s healthcare team to arrange: Home infusion needs such as central line supplies, IV fluids, antibiotics, GCSF. Nursing visits Medical supplies The discharge planner will work with your insurance company in identifying an infusion company/nursing agency in your area that can provide in-home care needs for your child. If you have a specific home health company/nursing agency that you want to work with, please let the discharge planner know. The discharge planner will also work with the medical team to ensure that your child has all the necessary prescriptions to take at home. If you have healthcare insurance other than Medicaid, you will need to fill your prescriptions outside of the hospital. Some helpful information to have is: What pharmacy can fill your prescriptions? What is your co-pay for prescriptions? There may be times that it is difficult to obtain certain kinds of medicine at outside pharmacies. When these circumstances arise, the discharge planner will work with our outpatient pharmacy and your local pharmacy to ensure that your child s prescription needs are taken care of. If you have any questions regarding your child s discharge plan, please ask to speak to the Discharge Planning Nurse. 4 Psychological Services The diagnosis and treatment of cancer is probably the most challenging and stressful experience your family will ever go through. Every patient and family copes differently and there is no right or wrong way to react to the situation. Many families do find it helpful to speak with a psychologist to help them with their coping efforts. The majority of psychological services for our patients and families are provided through a primary psychologist who is a member of the Section of Developmental and Behavioral Sciences. This psychologist has specialized training in the area of pediatric psychology, which focuses on the emotional needs of children with medical problems. The psychologist: Provides emotional support to children, parents and siblings Assists in helping family and pt obtain and use coping skills needed during diagnosis, hospitalization, treatment and procedures Assists with teaching relaxation training Assists the parents in determining how to talk to their children about diagnosis and treatment Assists parents in dealing with behavior problems that result from diagnosis, hospitalization and treatment Provides for psychological and educational testing to assist with cognitive and school functioning. Assists families that are concerned about the potential effects of certain tumors and treatments on the child s cognitive and school functioning by providing testing to evaluate. 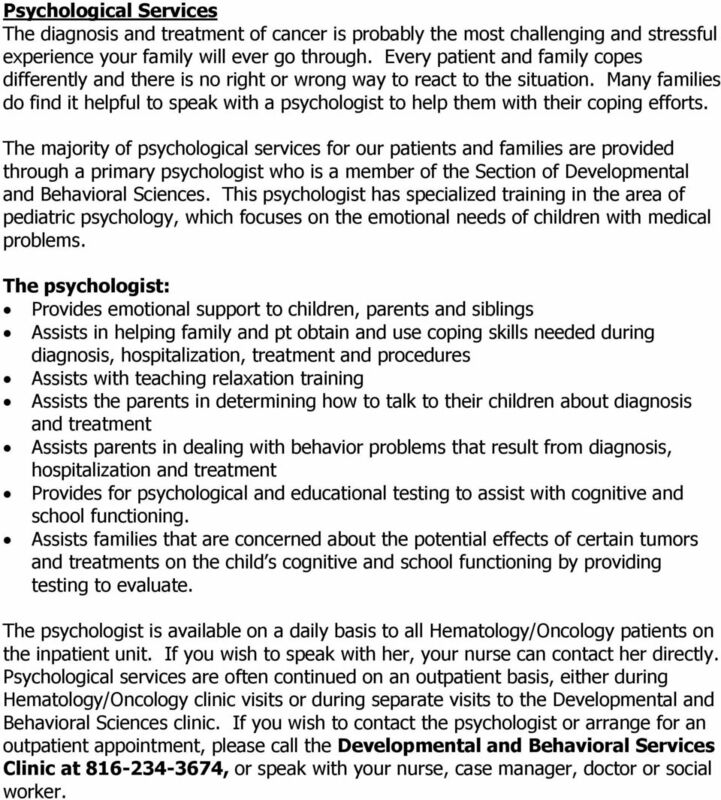 The psychologist is available on a daily basis to all Hematology/Oncology patients on the inpatient unit. If you wish to speak with her, your nurse can contact her directly. Psychological services are often continued on an outpatient basis, either during Hematology/Oncology clinic visits or during separate visits to the Developmental and Behavioral Sciences clinic. If you wish to contact the psychologist or arrange for an outpatient appointment, please call the Developmental and Behavioral Services Clinic at , or speak with your nurse, case manager, doctor or social worker. 5 Music Therapy Music has several characteristics that illustrate its therapeutic value. For example, music captivates and maintains attention and is easily adapted to and can be reflective of a person s abilities. Children like to be active; they deal with stress by playing or being active. The use of music is a way to distract your child and encourage them to be active by singing songs or participating in making music. Music: Provides a structured setting for verbal and nonverbal communication. Allows children a way to express their feelings and fears Supports and encourages physical movement Can be used during medical procedures as a diversion or to help decrease pain perception and to help your child to relax Is success oriented Children of all ability levels and ages can participate Because of the wide variety of musical styles, the music therapist is able to design music therapy sessions for individuals and groups, which are not only age appropriate but also address their specific needs. 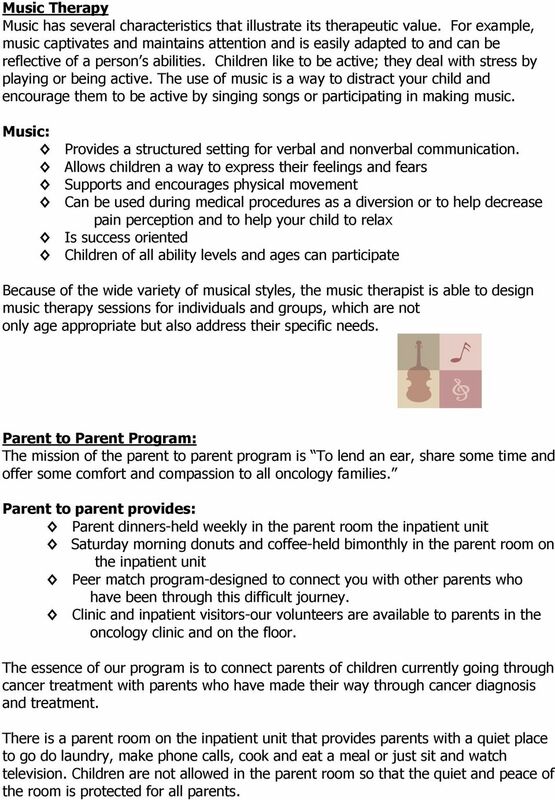 Parent to Parent Program: The mission of the parent to parent program is To lend an ear, share some time and offer some comfort and compassion to all oncology families. Parent to parent provides: Parent dinners-held weekly in the parent room the inpatient unit Saturday morning donuts and coffee-held bimonthly in the parent room on the inpatient unit Peer match program-designed to connect you with other parents who have been through this difficult journey. Clinic and inpatient visitors-our volunteers are available to parents in the oncology clinic and on the floor. The essence of our program is to connect parents of children currently going through cancer treatment with parents who have made their way through cancer diagnosis and treatment. There is a parent room on the inpatient unit that provides parents with a quiet place to go do laundry, make phone calls, cook and eat a meal or just sit and watch television. Children are not allowed in the parent room so that the quiet and peace of the room is protected for all parents. 6 Ronald McDonald House Kansas City supports two Ronald McDonald Houses. One is near the University of Kansas Hospital, the other is near Children s Mercy Hospital. Both are available to Children s Mercy Hospital families, depending on availability of rooms. Any family that lives 35 miles away or more and travels to Children s Mercy Hospital is eligible to stay. 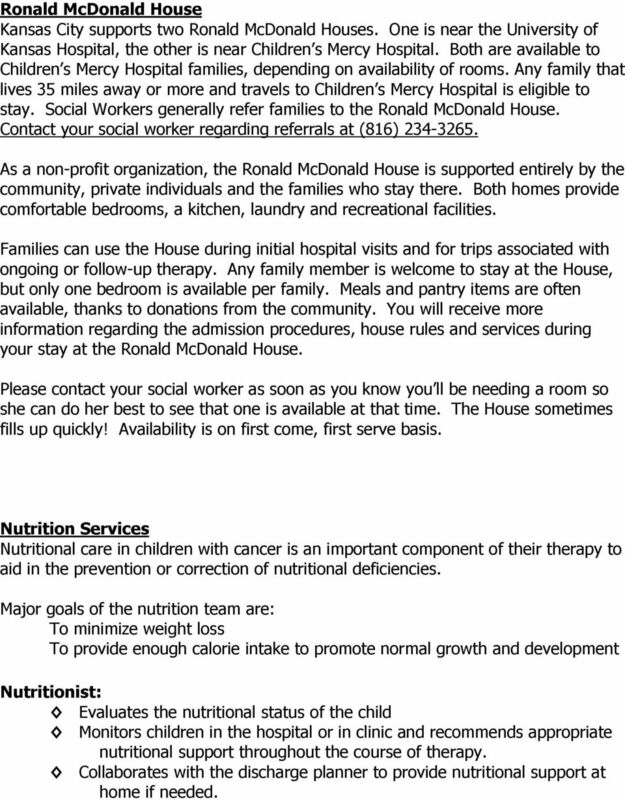 Social Workers generally refer families to the Ronald McDonald House. Contact your social worker regarding referrals at (816) As a non-profit organization, the Ronald McDonald House is supported entirely by the community, private individuals and the families who stay there. Both homes provide comfortable bedrooms, a kitchen, laundry and recreational facilities. Families can use the House during initial hospital visits and for trips associated with ongoing or follow-up therapy. Any family member is welcome to stay at the House, but only one bedroom is available per family. Meals and pantry items are often available, thanks to donations from the community. You will receive more information regarding the admission procedures, house rules and services during your stay at the Ronald McDonald House. Please contact your social worker as soon as you know you ll be needing a room so she can do her best to see that one is available at that time. The House sometimes fills up quickly! Availability is on first come, first serve basis. Nutrition Services Nutritional care in children with cancer is an important component of their therapy to aid in the prevention or correction of nutritional deficiencies. Major goals of the nutrition team are: To minimize weight loss To provide enough calorie intake to promote normal growth and development Nutritionist: Evaluates the nutritional status of the child Monitors children in the hospital or in clinic and recommends appropriate nutritional support throughout the course of therapy. Collaborates with the discharge planner to provide nutritional support at home if needed. Thank you for your interest in the with the Child and Adolescent Life Program at Duke Children s Hospital. Our internship program is offered three times a year: January April; May August; September December. One system. One hospital. One child at a time. Hospice Care. What is hospice care? What Services Are Included? LIFE Pittsburgh gives me a reason for getting up in the morning they give me a purpose in life and make me feel special. Introduction This Patient and Family Guide to Hospice Care is designed to be a practical source of information about hospice care. It introduces you to the history and philosophy of the hospice movement. Who We Serve Adults with severe and persistent mental illnesses such as schizophrenia, bipolar disorder and major depression. PALLIATIVE CARE AGS. THE AMERICAN GERIATRICS SOCIETY Geriatrics Health Professionals. Leading change. Improving care for older adults. All Saints. Personal Counseling Resources Guide. Episcopal Church & Day School. Pray. Learn. Serve. Connect. Pediatric. Psy c h o l o g y Pr o g r a m. Every child is born with great potential. Shouldn t every child have the chance to achieve it?